I still started too soon! Do not be too keen to begin any new weed control project until the weed is sufficiently luxuriant to drink up your Roundup (glyphosate). It is totally useless to zap your perennial weed as soon as it pops its little head out of the ground. I have waited until early May. It would have been even better to have waited until June! It is hugely detrimental to the success of herbicide based weed control to cultivate the soil before spraying and a complete waste of your energy and usually counter productive to cultivate afterwards too. The weed must be intact when you spray. I have a new project. Many of you know that two years ago I took over maintaining Cathi’s garden. No not the mowing nor putting up netting to contain her hens. Although I cut her side of our shared hedge I have previously shied away from the 20 foot high 100 yard long over-grown hedge that borders the road. Not cut for ten years it was badly overgrown. I do not take much credit for cutting the hedge down to six foot high. That honour falls to Peter Williams who brought his chainsaw and worked his eight hour way along it. With a little help from my son I dragged the heavy prunings into the garden. Two months later Pete and myself had a wonderful day burning a huge bonfire and as I have previously reported gained fourteen barrow loads of wonderful soil enhancing charcoal. For myself - sorry Cathi. To facilitate easy of mowing I had in the previous year sprayed off a four foot strip of lawn at the base of the hedge within Cathi’s garden. I continue to plant and develop a mainly herbaceous mixed flower border in place of the dead turf. No digging of course! On the roadside of the hedge a seven foot wide strip had had no maintenance at all. A further four foot was roughly mown by Mike from across the road. Needless to say that within the base of the hedge and on the outside of the garden it was full of perennial weed. It was mainly ground elder and nettles that gained five foot high every summer. A further detail relevant to the project was that there were sections of the hedge where elms had died several years before when infected by Dutch elm disease. In classical fashion when elms grow beyond shrub size and start to become trees the bark beetle brings in the deadly fungus. There were several large gaps in the newly cut back hedge. Peter and I plugged the gaps with beech and yew and left some dead elm trunks to support climbers that would give rapid screening. Impatient I could wait no longer and sprayed in early May with my knapsack sprayer. Ground elder is a difficult weed and one application will not be anywhere near enough to eliminate it. My experience on the village plot suggests that it will take at least a year and probably eighteen months before the ground elder is completely eliminated. Nettles are not terribly well controlled with glyphosate and I wanted to try MCPA. I did a little ‘trial’ and sprayed a section with just MCPA and the rest with a glyphosate/MCPA mix which I have previously found to be a very effective combination against other perennial weeds. MCPA alone will not kill grasses and gardeners use it to eliminate weed and keep any turf. I have other fish to fry and this detail was not significant to this particular project. Not only was there virtually no grass but I want in due course to replace any coarse grass with a finer grass mixture. Both recipes quickly knocked back the nettles. (It was the MCPA ‘wot did it’ ). A month later the tops of all the weeds were completely killed back by the glyphosate/MCPA mixture but the MCPA-only had not done very well against the ground elder. I did not expect that. I do know how effective MCPA is against nettles and many other perennial weeds. Different weeds vary in their sensitivity to herbicides and for the rest of this project I will just stick to glyphosate. When the afore mentioned month had elapsed after my first spray although growth had been slightly checked with the MCPA-only treatment it now had an even greater receptive leaf area to weedkiller. I sprayed it with glyphosate-only. It was too soon to spray the successful other section. This meant that two months after starting both sections in the comparison that yesterday at the end of June both had received exactly the same total amount of herbicide (one in the single double dose and the other in two separate doses). The two treatments are now out of ‘sync’ and this morning the now regenerating once sprayed area has been sprayed again with glyphosate. It took 20 minutes. The total time spent spraying since the start of the project is under two hours. The commercial glyphosate was the normal 360gm/litre strength diluted at 1 part in 50. The MCPA was Agritox, also 1 in 50. I sprayed just short of run off on a very still morning. I took me one hour to apply the first spray. A different approach to this blog post. The priority for this Summer is to completely kill the weed although it might take a little longer. The fact that the weed looks completely dead now gives the wrong impression. It will be sprouting again soon! If you have a similar overgrown area it is an excellent time to start now on the first of July. Addendum. Glyphosate will kill both nettles and ground elder. Ground elder will take much longer to be eliminated than nettles. Once all the persistent vegetative parts of the ground elder are killed it will be gone for ever unless allowed to spread in from adjacent land or reintroduced by careless planting. Nettles will return from seed if the cleaned plot is neglected. From inside the garden you can see the height of the hedge last summer. Although the project was not yet planned I had started to cut back some trees. Peter always leaves his projects tidy. You can’t imagine the debris we cleared. At this stage in late January there is no indication of the dormant bishop weed (ground elder) and nettles. This is the first time that anyone has enjoyed the snowdrops in the last ten years. They will be back even stronger next year. As a surprise for Cathi and planning for the future I had planted some native daffodils ‘in the green’. Early May was a little early to spray. The weed would be more receptive a few weeks later. I sprayed anyway. See how the weed infiltrates the hedge. Careful downward direction of the spray head ensures there will be zero damage to the hedge. July 1st the roles are reversed and the two treatments are out of step. After two months the glyphosate/MCPA mix needs its first respray (with glyphosate only this time!) Although the area sprayed with MCPA and glyphosate on separate occasions looks dead it is not. It will re-sprout very soon! The conifers were completely overgrown last year by the hedge and were completely suppressed and dying. Early last Summer I had opened them up to the light. They are now not only visible but thriving. Oh dear, the hedge now needs trimming! Ichtyoselmis macrantha but it once was a dicentra! The original collector in Hupeh in China noted that it was found in a very dark wood! If you have a very dark wood with deep black organic summer-moist soil you might like to try it! If your garden is like mine it might be very difficult to grow. As the holder of the National Dicentra Collection I am obliged to at least try and against all odds and by the skin of my teeth have managed to keep it for the last thirty years. First in Bolton Percy on a pH 7 neutral soil and now at Seaton Ross at pH 6.5. In both cases it has been in heavy shade under a tree. Unfortunately the constant moisture it craves can be in short supply under a tree in our low rainfall area. Every year my heart bleeds when cold dehydrating winds tear the fresh soft yellow gorgeous green growth on my dicentra. It is extremely important that young leaves are protected. 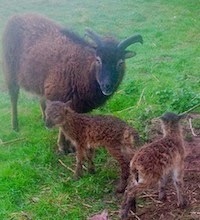 I have given them my most appropriate site but they always suffer and never achieve their potential delicate 45cm high. They only dane to flower at all if the previous season was kind. There is something about woods and companion plants that ichtyoselmis craves. You will see from my pictures that mine has ‘run’ with its probing long rhizomes as much as ten feet in and among other woodland plants. It has taken fifteen years and the shoots are very sparse. It might be wind protection, perhaps woodland mycorrhiza or merely the presence of nurse plants that it needs. I don’t know. I note in pictures of one of its woodland habitats in Sichuan that like my own plant it enjoys companions in nature in dense forest shade. Will the bees get a chance to pollinate in this windy weather? They have now been in flower for fourteen days - this is longer than normal. Does this indicate there has been no pollination? On the plus side my fishy named plant is extremely hardy. It did not suffer at all in our 2010 Winter when temperatures were -20 centigrade for several weeks. In contrast a very sharp late frost might blacken soft new growth in May. The soft growth on my ‘real’ Bleeding Hearts, Lamprocapnos spectabilis - I still call them dicentras - gets caught by frost every year and this year my plants have really been badly checked by an ill timed -4 centigrade frost in late April. Lamprocapnos likes protection from wind and cold too! Dicentra macrantha - please indulge me namewise - is a very difficult plant. Most ads on the net prove to be ‘out of stock’. They are not easy to propagate unless timing of division is precise and you have resource to a greenhouse. Not like ordinary Dicentra formosa when in late Winter you just chuck a few rhizomes in a pot! They do set seed and as I write now in mid May I hope to take pictures next month to show you! With luck I might get a couple of pods and a dozen seeds. They might even germinate. I seem to remember my existing plant came from a rare seed sowing success. As a natural species - they are not named cultivars - seedlings come true. Do you know any places where Ichtyoselmis grows? I remember I saw a remarkable huge clump in a woodland glade at Kew Garden thirty years ago. I doubt that it is there now. On my recent visit I failed to find it. In the right conditions it probably grows very well and might even be invasive. There must be several gardens on the warm wet UK west coast and in Ireland where they thrive. Please let me know if you have seen them. Best of all you might grow them yourself. Can I find a better place for my plant? Writing a post concentrates the mind! I now think there is a better place in my garden that was unavailable when I originally planted. It’s at the top of the garden next to Cathi’s fence and under the shade of an old cherry tree and near a young birch. It is protected on the windward side by shrub and bamboo planting and across the road is a wind proof high hedge. In a slight depression the site captures Summer moisture. Being sandy it’s very well drained in Winter! I think I will try it! I hate to disturb my established plant. Perhaps those anticipated seeds will germinate to give me new plants? I think I will have to bite the bull and take the cherry by the horns. It will be a very deep spadeful of soil from under one of the dicentra tufts. I think it will be in September, it will be dormant by then. Come to think of it at the other side of the fence it’s darker, more protected and moister. As most readers know I am Cathi’s gardener now. I have planted Dicentra spectabilis in this dark corner and it is really thriving. If the whats-its-name’s rhizomes spread under the fence they will be ideal companions. Perhaps by then I will be in the ground too. Please excuse my mischief if I suggest that if you are a digger-overer of borders there is no point in growing Dicentra macrantha. My established plant is not growing where it was originally placed. Those wandering rhizomes do not like spades! On second thoughts there may be places in Ireland where a chop with a spade is the best way of propagation! Update even before first publication! After yet another windy dehydrating early June day of protecting my flowering ichtyoselmis with folded garden chairs to get my pictures something snapped. No not the delicate shoots - it was me! I decided to lift and divide part of my plant. I would sacrifice a small clump! As mentioned the plant has weakly dispersed itself around and forking out a portion would not disturb the section that was flowering. I tried as far as possible to keep the long rhizomes attached to the soil. With varying success I managed to get a few small clumps. Some portions collapsed to loosen and reveal the long thin naked rhizomes. I potted them all into my favourite compost. I got six pots of propagules. The pots were immediately placed after heavy watering under my slatted greenhouse bench - it gives about 75% shade. Now on 21st of June I am pleased to report that they are thriving and are making some strong new shoots. I think Cathi is going to get her new plant ten years earlier than expected! On reflection my plan to divide them when dormant in September was perhaps flawed. I might have not even been able to find them! In addition the fact that my sandy soil tends to collapse away might have excessively disturbed the dormant rhizomes. Despite the horrible weather the flowers got pollinated. I caught a glimpse of a bumble bee as she flew by. The brave worker must have later returned for some nectar. I took just one pod on the longest day of the year. It was just six weeks after flowers had appeared. They are not quite ready but I have sowed them anyway. If they germinate it will be probably in Spring. Some seeds such as certain primulas germinate straight away if still ‘green’. 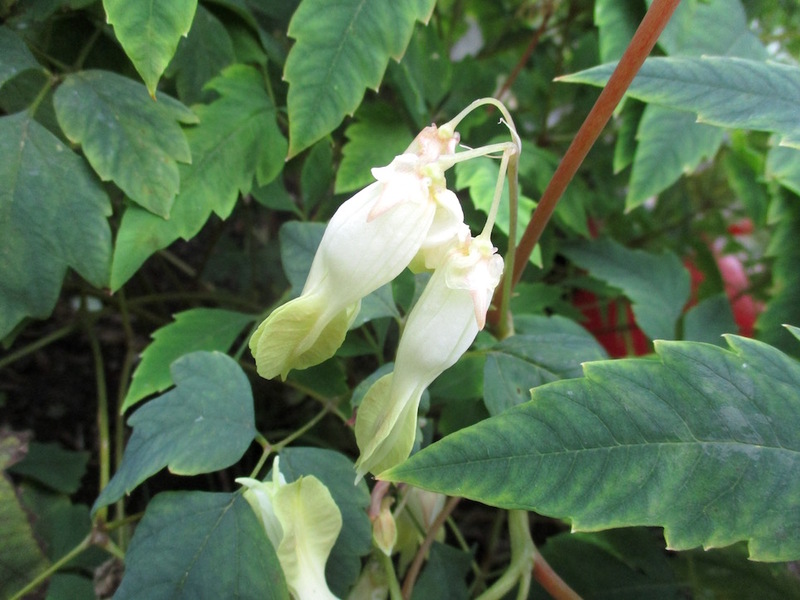 Who knows my dicentra might surprise me but it is very unlikely. I love those little white elaiosomes on the shiny black seeds. Common to most dicentra they attract ants who collect the seeds and disperse them. I love too the term myrmecochory that describes this phenomenon when a seed contains a tiny package of food to entice and reward the ant for this service. I don’t want the ants to pinch future viable seed and will watch my remaining pods carefully until they are ripe. My five plants are now planted. (I don’t know about the sixth, perhaps I miscounted?). The strongest is on the site previously pictured and another is on the even darker side of the fence in Cathi’s garden. On the other side of Cathi’s house the west facing wall makes a sheltered corner with her hedge and a plant has gone in there too. A plant has gone to Peter. He has a woodland garden. 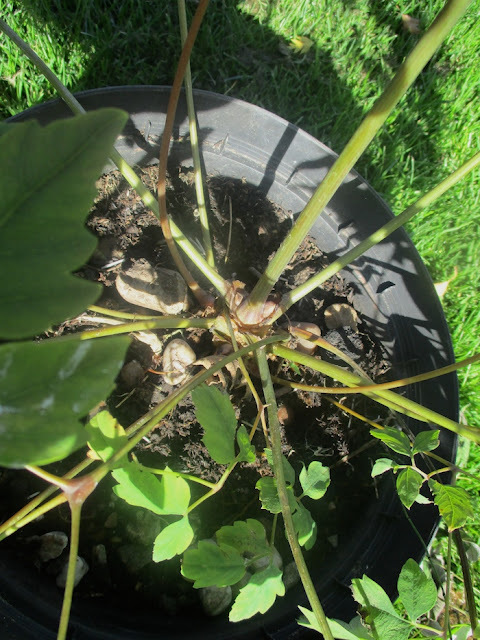 We work on the principle that if our original plant dies we can reclaim a propagule! I have planted a strong plant in the soil under the greenhouse bench where my propagated plants have grown in their pots all Summer. This I now confidently predict will give me many further divisions in the future. I promised Rick a plant at the end of next year and if he comes to my Open Day in September he can claim it! Last July I managed to collect a hundred seeds! A quarter have gone to Peter with a challenge! Half I sowed in a pot immediately as I normally do with dicentras. I do this in anticipation that they will usually stay dormant until Spring and that this stratification will best preserve them. Another quarter remain in a packet to be sown in my unheated greenhouse in January. 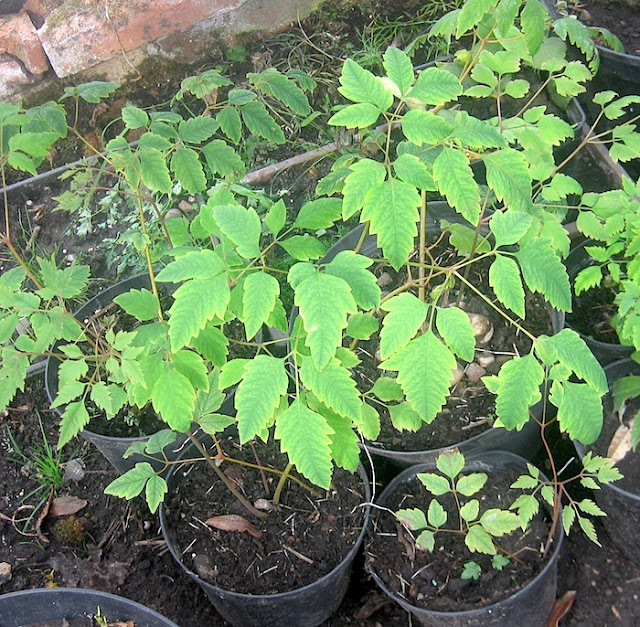 The picture shows a single seedling that emerged in September. At that time it was doomed and duly met its demise. Apologies to those who have been enticed by my recent promotion of this update and have come expecting a fish! The young plant that was planted in the soil under the bench in my unheated greenhouse has made an extremely sturdy plant that has given me lots of propagation material. Above it provided a second crop of flowers in August this year. Still in his tunnel Peter's plant is thriving. My planting at the top of the garden is after a difficult start getting into its stride. Cathi's two plants died. Rooks live and congregate together in large groups. Like other corvids - crows, magpies, jays, jackdaws and ravens they are very intelligent birds. They have as much neurological nous as those other animal geniuses, the cetaceans and the great apes. Indeed their ability to use tools might be greater than that of a monkey and I imagine a corvid looks down on them in distain. In telling their stories I will more or less group them together. In intelligence there are variations between species and although clever individuals will out think their relations they all provide an insight into theory of mind. 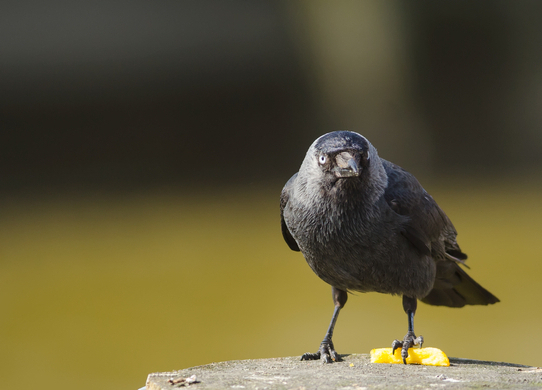 Serious estimations compare corvid intelligence with that of a four year old child. Some sources say seven! It is sometimes suggested that their intelligence has developed from living together in complex communities. They have excellent facial recognition and indeed can recognise and remember we humans too. They will remember a disservice and bare a grudge - perhaps a man with a gun. They will also remember and greet a friend, even bring him a present, after no contact in years. 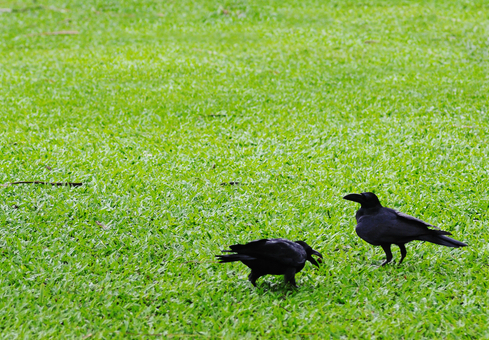 It is said that crows can communicate their displeasure with an enemy. A murder of crows is a most apt expression. It might seem inconsistent with the theory that intelligence might evolve from a need to cohabit in large groups when solitary corvids are equally clever. I wonder how much hybridisation has contributed to the shared intelligence between these animal Einsteins. There are fascinating examples of crow hybridisation. 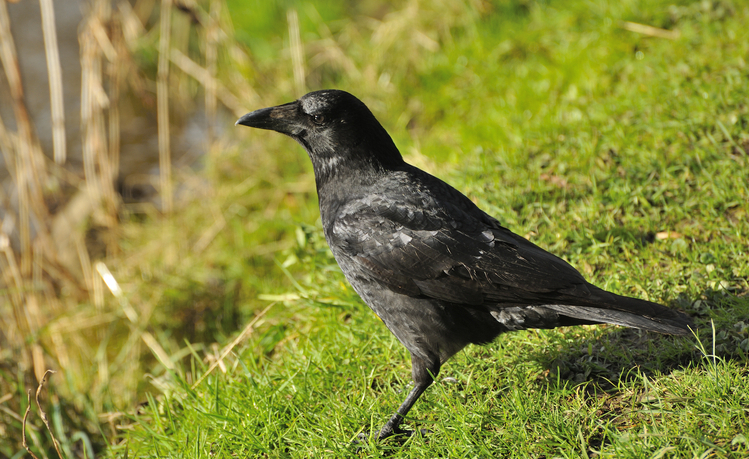 The carrion crow and the hooded crow are virtually genetically identical. In eight million DNA positions on their genomes variable code could equally apply to either species. Only in eighty three places is the code diagnostic for one bird or the other. Mind boggling when you consider that some of the differences between them are not insignificant. An American bird breeder advertises his hybrid ravens as a means to circumvent the US laws against domesticating native species. They apparently make wonderful loving and caring companions. I frequently nearly crash my car when dumb pheasants wander into the road. Not so with corvids. 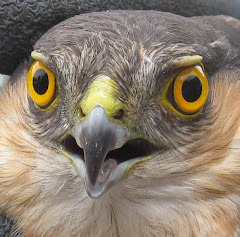 They steelily look you in the eye as they pick at some carrion and flit away at the very last moment. Even if you wanted to, you would fail to hit them. 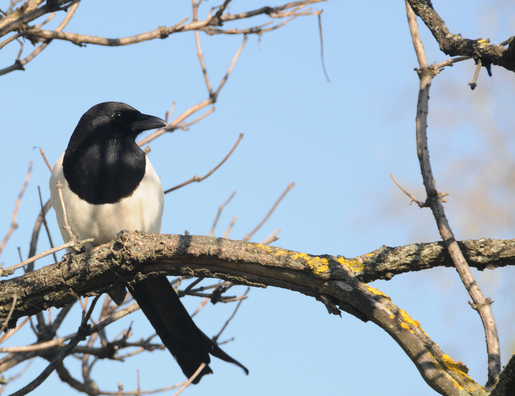 It is ironic and arrogant that magpies and crows are classified as vermin and can be shot on a whim. Crows have been observed watching the traffic lights turn to red to take a serving of ‘road kill’. As the lights turn back to green they hop away to await the next course. Japanese corvids exploit the traffic in a different way when cars shell their nuts that they drop in the road. They seem to have got cars ‘sorted’. An American professor has befriended the corvids that he studies. They recognise his car as he drives to the research site and fly in parallel with the driving seat as if they belonged to Air Force One! Cathi tells me that a crow used to follow Harry’s bike to school every day. I can just imagine it slip streaming the back of his ears. The crow would fly home and pick his mother’s pegs off the line. Although trivial, personal stories are best. Cathi remembers as a child in Africa when a corvid regularly mimicked her baby sister crying and her mother would come running. What was really clever was that the crow was not merely mimicking but was having fun as it cawed away at her mother’s ire. 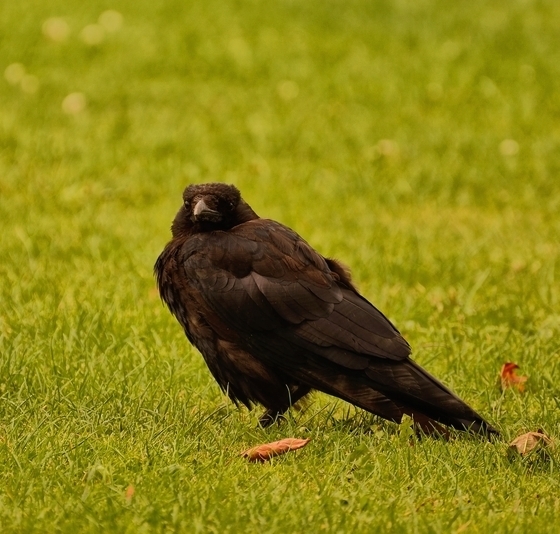 What a fascinating story which encapsulates several corvid characteristics. Like humans they have a very long childhood because they have so much to learn. They clearly are able to communicate such information. In addition they do not just rote learn but can solve problems too. In an Aesop fable a crow raises the water level in a pitcher to drink by dropping stones in the water. This has been experimentally verified when water levels have been similarly raised up in a beaker. When no stones were provided the crow flew off and brought back his own. On another occasion a floating tasty caterpillar morsel was similarly elevated. Apparently when offered potentially floating ballast the crows have the wit to refuse it. It is well known that some corvids fashion twigs to extract insects from nooks and crannies. They have learned from their parents the relevant pruning. Apparently designs vary with the birds geographical distribution - a sign of learned behaviour and a high level of thinking they share with the great apes. One clever crow fashioned a suitable hooked tool by twisting wire. Jays have prodigious memories with regard to storing their food. They remember hundreds of sites and when to return before different foods ‘go off’ in the larder. They have well honed skills of deception when they know potential thieves are watching. Sometimes they will go back later to recache elsewhere. 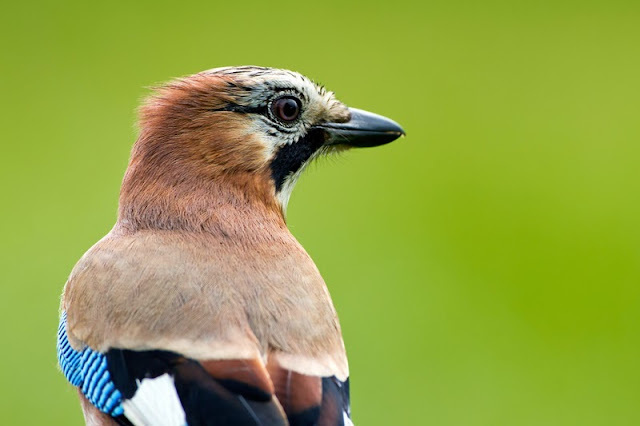 Jays that themselves have thieved are the most cunning cachers. They have a rather cruel humour. A blog correspondent related the story of his daft dogs in his walled garden. The crows would goad the dogs and taunt them to chase. They would fly close to the ground and at the last minute would swoop vertically. The dazed dogs hit the wall. This was repeated ad nauseum and the dogs never learned! I looked out of our conservatory and there were a thousand crows feeding on grubs in the farm field. I stealthily sneaked out ever so quietly with my camera. No joy their lookouts immediately spotted me and immediately flew away. I did not want it, but it was such a feeling of power that all these intelligent birds thought me a threat.